The New Mexico State volleyball team (20-7, 10-4) defeated WAC newcomer California Baptist (20-10, 9-7) Saturday, Nov. 10, by a final score of 3-1. The Aggies lost to CBU when the two teams first faced each other back in September. This was the start of the Aggies’ last home stand of the season before they head to Bakersfield, California, for the WAC tournament. To start the game, the two teams traded points until the Aggies got a couple of kills from sophomore Ashley Anselmo. The Aggies then got a couple of ace serves from senior Briana Ainsworth to put the Aggies up 15-11, which forced the Lancers to call a timeout. The Aggies didn’t lose any momentum as they went on a four-point run after the timeout to take an eight-point advantage. The Aggies would keep their lead and win the first set 25-16. The second set for the Aggies was a complete 180. The Aggies started flat and found themselves in a hole down 13-7. Not much would change throughout the set and the Aggies would lose 25-11 to tie the match at one set apiece. NMSU senior Tatyana Battle was clearly looking to give her team a spark after losing the set, as she came out in the third set on fire. The Aggies started the set on a 6-0 run with Battle recording four of the kills during that span. After giving up just a single point, NMSU would go on another 6-0 run to extend their lead to 11. The Aggies would continue to cruise throughout the third set and would eventually come out on top 25-8. As in the second set, the Aggies started the fourth set slow and immediately found themselves down 7-1. NMSU was able to rally midway through the set and come within two points of the Lancers. While serving at the line, Battle would record three straight service aces to give the Aggies a one-point advantage. 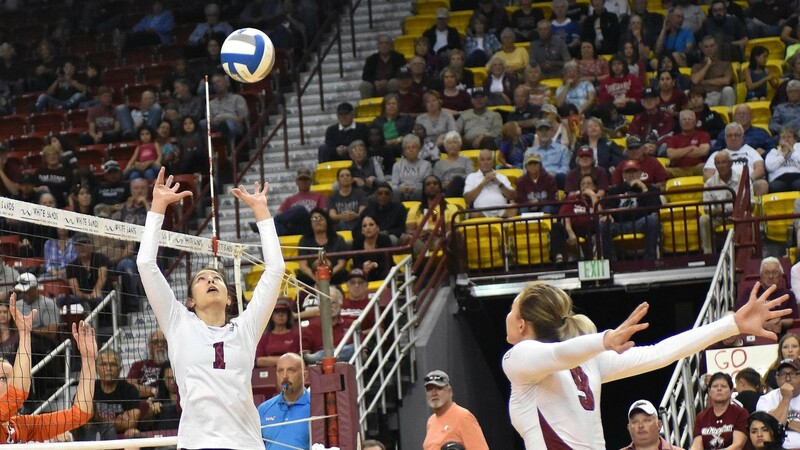 NMSU would not give up its lead, and with the help of some attack errors by California Baptist, the Aggies would win the set 25-20 for their 20th win of the season. The Aggie volleyball team has now met the 20-win milestone 15 out of the last 17 seasons. The Aggies had two players record double-doubles. Freshmen Savannah Davison had a game-high 14 kills and 12 digs and Tatyana Battle posted 13 kills and had a team-high 20 digs. The Aggies are now heading into their final week of the regular season as they next host the University of Missouri-Kansas City on Thursday, Nov. 15, at 6 p.m. inside the Pan American Center.